Whether it’s a new POS, drive-thru timer, or other restaurant management application, adopting new technology is expensive and highly disruptive. In fact, it can blow up your business processes if the data can’t flow everywhere it needs to be. Wouldn’t it be great if you could stop worrying about IT issues and focus on growing your franchise and making it as profitable as possible? You can! Using Delaget Connect, you no longer need to invest time, money, or people in managing data, so you can focus on running great restaurants. See for yourself what’s special about Delaget Connect with the resources below. We’ll integrate with all your data sources to bring you a consolidated, consistent view of your operation. And we’ll build and manage exports to any of your home-office systems like payroll, banks, ERP, and reporting. This flexibility means you can add or subtract best-in-class point solutions at any time, without impacting your team. We’ll provide proactive tools and reports to ensure data from every one of your systems is complete and correct. Missing data from the Philadelphia store? No problem! We’ll identify any missing files to make tracking them down simple, so you’ll always have complete reporting and analyses. Daily oversight and hands-on management of your data is critical for an efficient, secure, and compliant operation. In addition to our support desk, we’ll monitor your system 24/7 and handle all software updates, security patches, backups, and user/location administration. We’ll even take care of impact analyses, compliance audits, and regulatory changes. 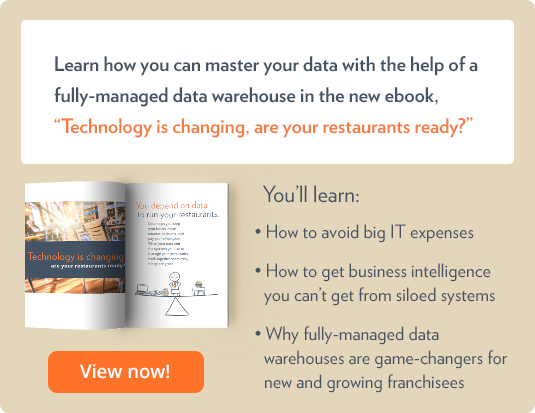 We’ve been helping franchisees with data warehousing solutions for nearly 20 years. (We were in the “Cloud” before there was even a name for it!) We process about 1 billion transactions each year, comprising 4.2 billion data elements from 60 countries. We bring this experience to every customer engagement. Learn how end-to-end data management with Delaget Connect can free you to focus 100% on your operations.